New Delhi : Samsung has launched the Exynos 7 Series 9610 with deep learning-based image processing support. It is considered as the mid-range mobile application processor with image processing support. Sources confirmed that the launch will be publicised after a few months, this year. The company will also reveal the list of smartphones that will feature the new SoC. Before Samsung Exynos 9610 SoC hits the market, take a look at its features and technical specifications. The new SoC is designed to offer advanced slow-motion video recording with an as high frame rate as 480 frames per second (fps) at full-HD (1080p) resolution. Build on Samsung's 10nm FinFET process, the Exynos 9610 comes with a neural network engine which enables improved face detection alongside providing vision and image processing. Mostly, the advanced face detection feature is added to enable the camera sensor to recognise faces that are either not facing forward or even partially covered with objects such as hair or a hat. The SoC is also capable of support single camera out-focusing and augmented low-light images. Likewise, there is smart depth sensing to enable Bokeh and out-focused portraits using a single camera sensor. Well, it can be compared to what Google implemented on the Pixel 2 series using a mix of software and hardware tweaks. In addition, the Samsung Exynos 9610 combines multiple frames, with vision and image processing to increase the signal-to-noise (SNR) and brightness - eventually, to improve images captured in low-light environments. For videos, the Exynos 9610 has 480fps support as well as 4K video recording at up to 120fps in HEVC (H.265) format. There is an image signal processor (ISP) that improves performance by 1.6 times and more-than-doubled mobile industry processor interface (MIPI) speed. Such kind of performance was previously a part of the Exynos 9810 SoC that Samsung added to the global versions of the Galaxy S9 and Galaxy S9+ models. The new SoC supports up to 24-megapixel singular camera units or dual camera setups with up to 16-megapixel primary and secondary image sensor combination. The Exynos 9610 SoC has four Cortex-A73 cores at 2.3GHz and four Cortex-A53 cores of at 1.6GHz. Also, there is a second-generation Bifrost-based ARM Mali-G72 GPU and support for LPDDR4X RAM. To allow features such as gesture recognition and context awareness, the SoC has an in-built Cortex M4F-based low-power sensor hub. This is believed to powerfully manage sensors in real-time, without waking the main processor. In case of network connectivity, Samsung has provided an all-network LTE modem that supports Cat.12 3CA at 600Mbps for downlink and Cat.13 2CA at 150Mbps for uplink. The Exynos 9610 SoC also has 802.11ac 2x2 MIMO Wi-Fi, Bluetooth v5.0, and FM radio. Additionally, there is a 4-mode Global Navigation Satellite System (GNSS) receiver to offer GPS, GLONASS, Beidou, and Galileo. 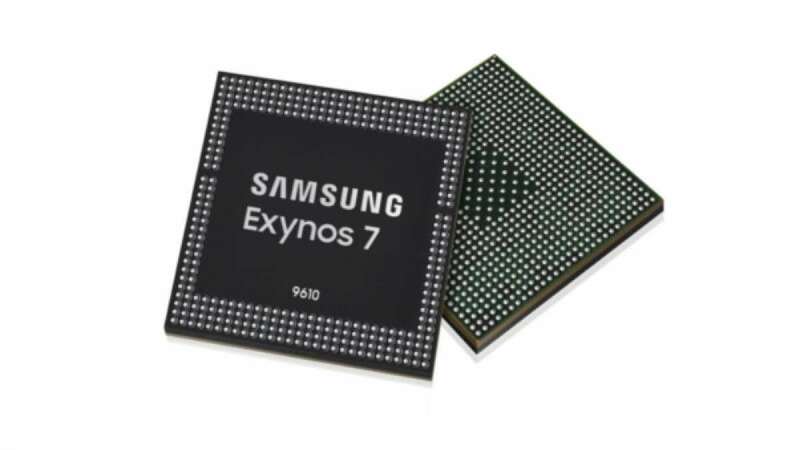 Ben Hur, Vice President of System LSI Marketing at Samsung Electronics said,” The Exynos 7 Series 9610 is our latest mobile processor that delivers on added power and speed. But more importantly, it sets a new performance standard for high-end devices with its deep learning vision-image processing solution and slow-motion video capabilities that change the way we engage with our mobile devices."